toon|Hearing Analyzer/Lite Support - toon,llc. "Hearing Analyzer / Hearing Analyzer Lite" is an ear wellness application that can be easily measured the frequency characteristics of your hearing. It covers a wide frequency range of up to audio band from voice band. You can self-diagnose the audio listening ability. "Hearing Analyzer" is recommended to check your own hearing ability on a daily basis, people anxious to hearing, music players, sound professionals and all music lovers. 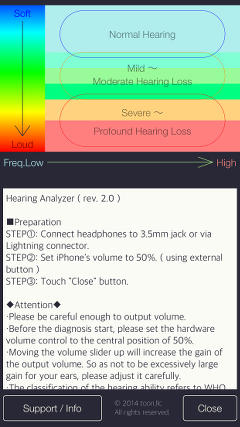 "Hearing Analyzer Lite" is a free app that has simplified the hearing check function of "Hearing Analyzer". By measuring the characteristics of your current hearing, please try to consider the wellness of your ears and the way of natural sound reproduction. It is possible to measure the hearing of the audio range by finding the minimum point in the operation of the slider volume that you can hear the tesing pure tone for each frequency. 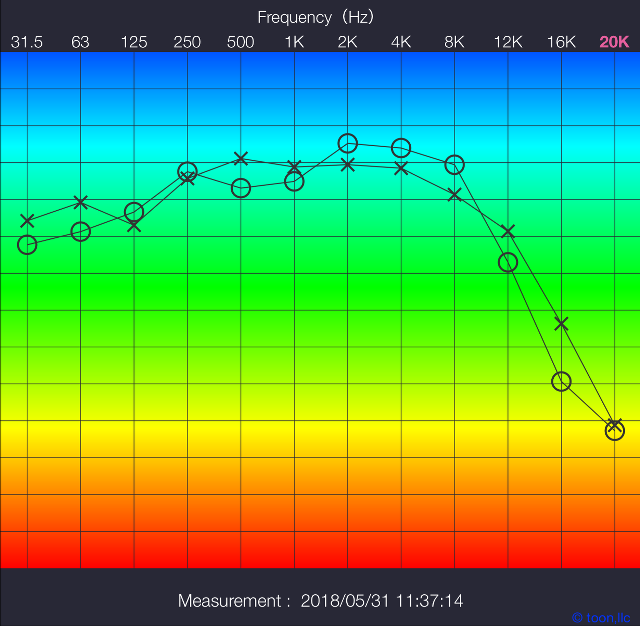 The results are displayed in easy-to-read charts like the audiogram. In general, a high risk of hearing loss has been known if you continue to hear the sounds of a high acoustic pressure level, such as, listening of the portable audio and working with too loud noises. According to WHO, some 1.1 billion teenagers and young adults are at risk of hearing loss due to the unsafe use of personal audio devices, including smartphones, and exposure to damaging levels of sound at noisy entertainment venues such as nightclubs, bars and sporting events. Please use the earphones that provided with the iPhone in the hearing test. This application generates a test tone signal with a high gain, so please special attention to the volume adjustment. Before the diagnosis start, please set the hardware volume control to the central position of 50%. If the volume slider is moved to the right side, the output volume will have a large gain. So as not to be excessively large gain for your ears, please adjust it carefully. The classification of hearing ability refers to WHO. Please to click the following link to download "Hearing Analyzer" from App StoreTM. It will be open the download page on App StoreTM. Please to click the following link to Free download "Hearing Analyzer Lite" from App StoreTM. It will be open the download page on App StoreTM. Recommendation : Requires iOS 11.4 or later. Reduced measurement time for simple user interface. Generation of the pure tone for hearing check. Optimized for iPhone, Very compact code size. Simple testing of the hearing loss. Confirmation of the listening skills of the audio band. Self-check the maximum audible frequency. 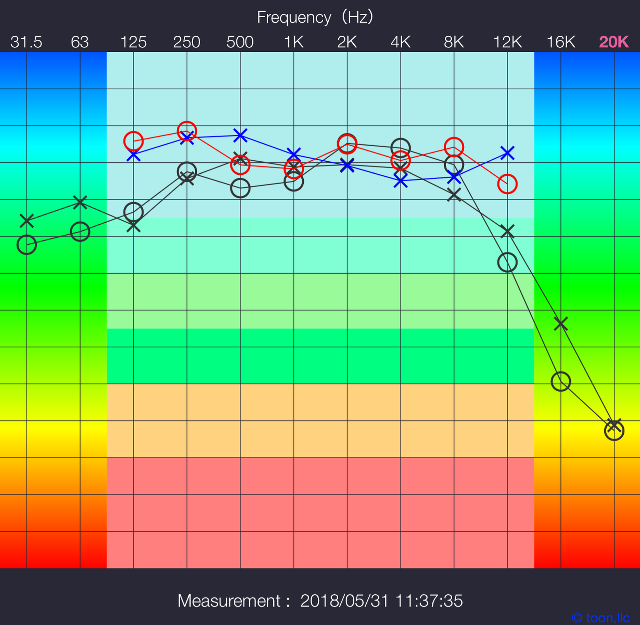 At the start of "Hearing Analyzer / Hearing Analyzer Lite", the info view will be displayed. Please make sure you read the description and attentions. If you tap the "Close" button, the Top view will be displayed. 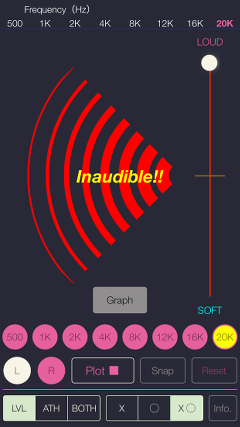 In "Hearing Analyzer Lite", please tap "OK" button. Operation procedures in this application are as follows, please use this app carefully according to the guidelines. Step 1 : Connect the earphone into 3.5mm stereo Mini jack. Step 2 : Set iPhone's volume to 50% by using the external button. Step 3 : Tap "Close" button of the Info view. Step 4 : Set the headphone to your ears. In "Hearing Analyzer Lite", please set the headphones only to either ear. Op-1 : Tap "R" or "L" button to select hearing test channel. "Hearing Analyzer Lite" is only stereo output, there is not channel selection. 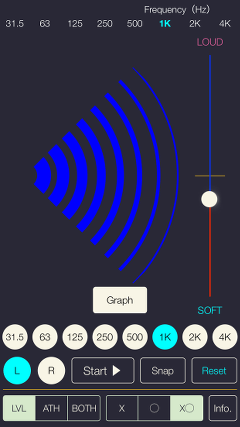 Op-2 : Tap "Frequency" button to select a measurement frequency. ie. 1Khz. Op-3 : Tap "START" button. It starts to be output the test tone, periodic sound of pure tone. Op-4 : Move the volume slider, please looking for a limit point of listening. Increase the volume enough to slide to upper. Be careful so as not to be loud and move slowly as possible. 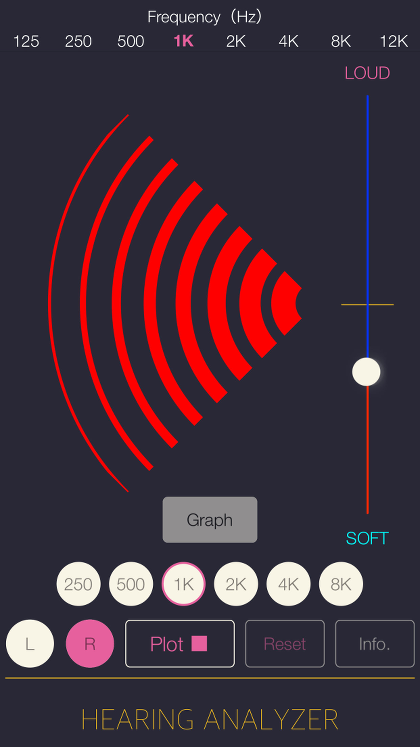 Op-5 : Once you have determined the minimum point of listening, please tap "PLOT" button. Op-6 : Subsequently, if you want to measure the frequency of the other, please repeat from the operation of Op-1. Op-7 : Please tap "GRAPH" button after these measurements were completed. 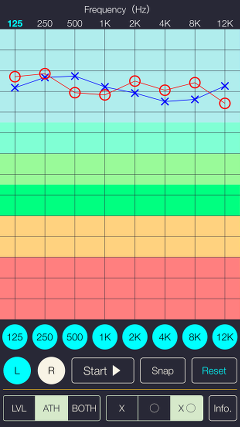 Result of the measurement graph is displayed. Op-8 : By tapping "RESET" button, you can reset the measurement result graph and each settings. Op-9 : By tapping the "Snap" button, the measurement result graph can be saved as image data to "Photos". The more you slide the volume slider, the louder the sound. At the maximum volume, "Inaduible!" Is displayed on the screen, and the measurement result is not reflected even if you tap "Plot" button. This state shows the hearing measurement limit level, the frequency button turns yellow and a warning is displayed. 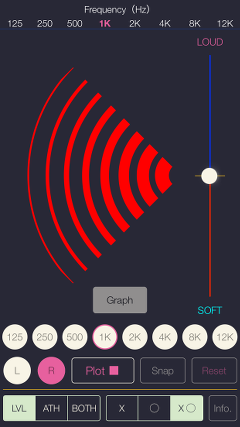 This app will display a graph result of the measurement of the minimum sound in each frequency that you could take to hear. The measurement result graph has two display formats: LVL graph (broadband frequency characteristic display, no ATH correction), and ATH graph (frequency characteristic with ATH correction). 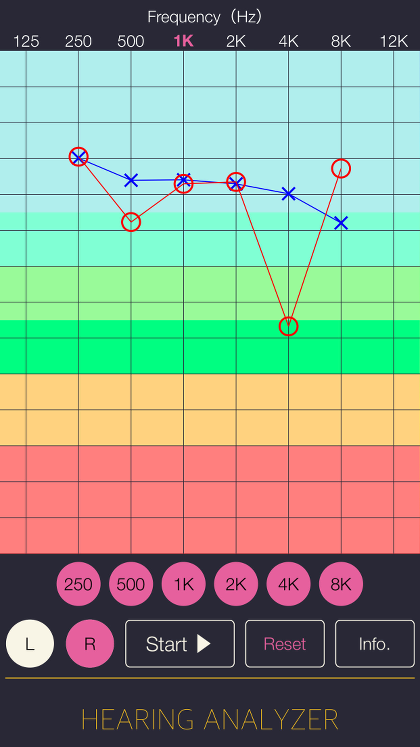 In "Hearing Analyzer", you can switch the graph display by "LVL", "ATH", "BOTH" button. In addition, you can switch channels in the graph display with x (left), o (right), and xo (left and right) buttons. Please use them to compare measurement results as necessary. This is a graphical representation of wideband frequency measurement. It shows a linear frequency characteristic without ATH compensation. It covers the frequency range from 31.5Hz to 20kHz. Since the sensitivity of human hearing is different depending on the frequency band and will be a trapezoid graph in general. Please use it if you're looking at a difference in each frequency. This is a graphical representation applied compensation of the frequency characteristics to fit the lowest audible value of human beings. 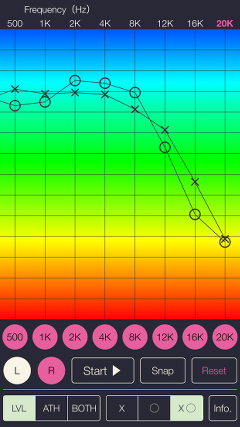 If it is a higher level and flat as possible, the graph is estimated to be good condition of your hearing. 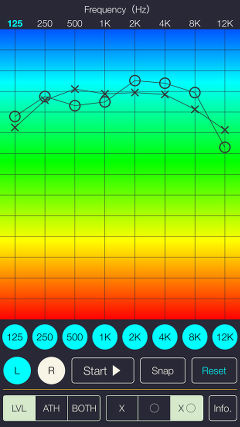 This graph has the same characteristic display as the general hearing test (audiogram), and supports the frequency range from 125 Hz to 12 KHz. In addition, the Absolute Threshold of Hearing (ATH) is the minimum sound pressure level that can be detected by hearing noise-free environment. It has been corrected to be a flatter graphical representation for each frequency in the case of normal hearing. However, it may display levels vary significantly, due to the surrounding environment and individual differences. By tapping the "Snap" button, the measurement result graph can be saved as an image data to "Photos". Since it can save with time stamp, please use it when you want to save your measurement result. By tapping "info" button in the Top View, it is displayed the App information. If you tap the "Support/Info", Safari starts and you can see our support page. By tapping "Close" button, it returns to the Top View. In "Hearing Analyzer Lite", please tap "OK" button. We hope that you keep to have an interest on a daily basis to the wellness of hearing by this app. If you feel the need to health management of ear, it is recommended to visit the medical specialist. Please be careful that high-volume sounds can damage ears, even if your ears don't perceive them as being too loud. Please have enough attention to adjust the volume of the iPhone. Recommend to use safely in airplane mode or WiFi disabled mode. Views on hearing loss risk by WHO. This app is not intended to be used for a medical purpose. This app is not intended to diagnose, prevent, monitor, treat, alleviate or compensate a disease, an injury, a disability or a handicap. If you think you have hearing problems, please consult with your doctor, or other qualified healthcare professional. Please use this app at your own risk. TOON,LLC don't take any responsibility for direct or indirect damage that could result from its use. Please send a review message for "Hearing Analyzer". Please send a review message for "Hearing Analyzer Lite".